Our team of young public speakers has gone from triumph to triumph in the Rotary Club "Youth Speaks" competition. 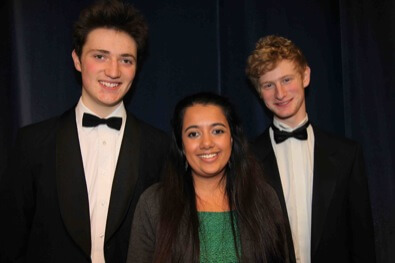 Brian Clarke, Natasha Seneviratne and Michael Jacobs defeated teams from across the Thames Valley on 20th March and then went on to win the South East regional final on 24th March. The judges described them as the "clear winners". They now go on to speak once more about "The green-eyed monster" on 28th April at the University of Hull, where they will compete against teams from all over Great Britain and Ireland.